Stamford Talk: Eat, Think, Drive, Blog! 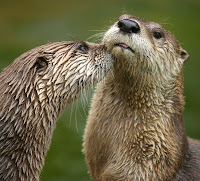 : Otters Are $%#&@* Adorable! If you are going to Lakeside Diner this weekend, you better get there before like, 9am at the latest. The Advocate has an article about how they've spotted otters in the pond beside the diner, which is off exit 34 on Long Ridge. The food is good, and the donuts are even better at Lakeside... and everyone loves otters, so the place is going to be crammed! To view otters any time, go to Stamford Museum and Nature Center! They have 2 cuties there. Admission is free on Wednesdays. See my previous post about SMNC to learn more. YES!!! I got a blog post done!!! Have some otters on a pond in Virginia, did you know those guys can really eat? Love otters and donuts... sounds like the perfect place to eat! I was there on Saturday. I saw a Woodchuck. I wonder if reports are mistaken. Lots of muskrats in North Stamford.